For some people the simple idea of being watched is both overwhelming and even a bit upsetting. For some people the pressure of being observed actually inspires them to be better. 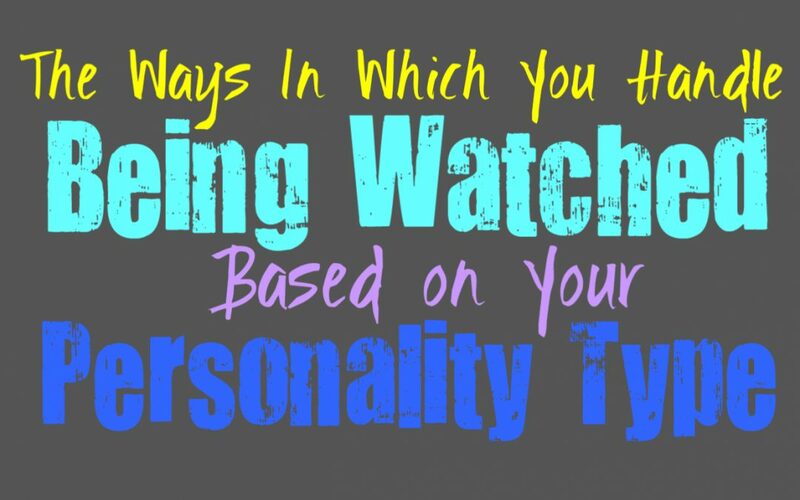 Here is how you handle being watched, based on your personality type. INFJs rarely appreciate feeling like they are being watched, since this can put undue pressure onto them. They prefer to get things done on their own terms without feeling as though someone is constantly judging their actions. For the INFJ this can actually be both overwhelming and feels a bit creepy. They don’t want people watching them, especially if that person has negative intentions and they can often feel this energy. When the INFJ has someone they love deeply and feel safe with, this is an entirely different story and they might even enjoy feeling washed by that person. ENFJs actually don’t like being watched most of the time, since they are such outgoing and intense people. They work hard to get things done and don’t mind feeling like people are observing them. Sometimes ENFJs enjoy the attention, especially when people are observing them take care of something they are skilled at. They are often used to people paying attention to them and having themselves as the center of attention. ENFJs are strong-willed people who might even take being watched as incentive to push themselves even harder. INFPs can go back and forth when it comes to their feelings about being watched or observed. For them it can be too much pressure in certain situations, especially if they are being watched by more judgmental people. If they feel like they are under a microscope and being dissected based on their behaviors, this isn’t something the INFP will enjoy or appreciate at all. They do however, enjoy a bit of attention from time to time and might not mind feeling all eyes in their direction for the right thing. They are often good at drawing attention to themselves, but only when they want it. ENFPs sometimes enjoy being watched and feeling like they are the center of attention. They don’t like being ignored and so feeling like people are observing them is often far better than the former option. For the ENFP it can be enjoyable to feel like others are paying close attention to them, especially when they are attempting to be entertaining. For them it simply depends on the situation, since they do have moods where they want to be left alone and dislike feeling the pressure of people disrespecting these wishes. INTJs don’t necessarily feel nervous from being watched, sometimes they take this as inspiration to really push themselves harder. They do enjoy the opportunity to prove people wrong and sometimes this requires a bit of an audience. For the INTJ being watched by someone who really has no reason to do this, is both irritating and even a bit draining. They would rather have their space in most situations, and enjoy being able to do things on their own terms without feeling the annoyance of people breathing down their neck. ENTJs don’t mind that feeling of being watched by others, since they might even be a bit used to it. They have larger than life personalities, and even enjoy being the center of attention. For the ENTJ it can be rewarding to feel like people are drawn to them, especially since they consider themselves capable and efficient people. They do whatever it takes to get things done, and even enjoy having a bit of competition in order to push themselves even harder. INTPs can have mixed feelings about being watched by those around them, depending on the people and the circumstances. When the INTP feels like people are watching them, sometimes they believe those people are just waiting for them to fail. They don’t much enjoy that type of negativity, and would rather be around people who appreciate them and give them space to do their own thing. INTPs do enjoy taking risks and so they really don’t want this feeling like people are constantly watching them in case things don’t go exactly as expected. ENTPs really don’t mind being watched and might even draw the attention in their direction on purpose. They want to be someone that others are entertained and impressed by. For the ENTP being watched often feels like a natural state, since they are rarely boring or lackluster people. ENTPs have outgoing and fun personalities, and are sometimes even a bit intense. For the ENTP being ignored is much more unpleasant than feeling like they are constantly being watched by those around them. ISTJs don’t necessarily enjoy being watched but it isn’t something that makes them feel overwhelmed. They often take this as an opportunity to push themselves and improve. ISTJs often find themselves under a microscope, simply because they work so hard to propel themselves forward. They realize that sometimes they will be observed and watched by others, simply because they put themselves in the position to be someone others need to compare themselves to in the workplace. ESTJs don’t mind being watched by others, especially since they are such competitive people. Sometimes feeling as though others are observing them, they simply push themselves to be even better. They might even enjoy this experience since they are outgoing people who don’t like being ignored. They would often prefer to be the center of attention, rather than feel like they are slipping into obscurity. ESTJs work hard to be efficient people and they don’t mind feeling like others are waiting for them to fail, it just pushes them harder. ISFJs don’t really enjoy feeling the pressure of being watched, and this can often make them really uncomfortable. They don’t want others observing them when they are simply trying to get something done to the best of their ability. ISFJs are hardworking people who want to do their best to provide for others and be the best at what they do. For them it is both uncomfortable and even a bit awkward to feel like someone is watching them, especially when that person has no reason to do so. ESFJs can get a bit creeped out by people watching them, and the pressure can be a bit overwhelming. They work hard to provide for others and have a bit of a perfectionist mentality. The fact that they have such a strong desire to perfect everything they do, actually adds a lot of pressure onto their shoulders. If the ESFJ feels like people are watching their every move, it can cause them to feel nervous enough to make mistakes they normally would not have made. ISTPs don’t often mind being watched, but they do reach a point where they just want to be left alone completely. They are independent people who enjoy their space, but that doesn’t mean being observed or having people watch them is all that upsetting for the ISTP. They can sometimes enjoy the feeling that they are interesting enough to draw the attention of others, they just don’t always want to interact with those people or have to deal with them face to face. ESTPs don’t often mind being watched a bit, since they do like the attention. For them it depends on how long this lasts or what the intentions of the people observing them actually are. ESTPs can enjoy being the center of attention, but they also realize that sometimes people are watching them with judgmental eyes. Most of the time this doesn’t really upset the ESTP, unless it is work related. When it comes to a work environment they can become a bit stressed feeling as if they are constantly being observed. ISFPs don’t mind being watched by certain people, but by strangers it is actually a bit unnerving. If someone is watching them when they are working on something important, it leaves them feeling anxious and even a bit judged. For the ISFP it entirely depends on the people around them, since certain special people don’t drain them at all. When they trust someone the ISFP feels completely at ease with this person being around all of the time, and so being watched by them does not become upsetting. ESFPs don’t mind being watched at all, sometimes they even enjoy this. They want to feel like people actually care enough to pay attention to them. ESFPs would rather be watched by others than be ignored, since feeling unimportant is one of the worst things for them. ESFPs want to feel connected to others and so they can certainly cope with being watched or observed by others. It doesn’t put pressure onto the ESFP like it can for other people, it just makes them feel like they are important.